Andrew W.K. has to be one of the busiest, most bizarre dudes we know. Not only has he prepared a full album of improvised piano pieces, but now the hard-partying rocker has announced that he'll be serving up a record of J-pop tunes from the beloved Gundam anime series. 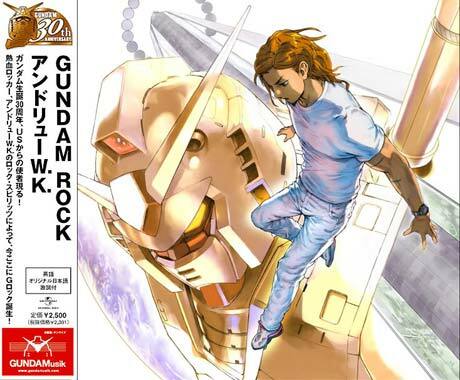 The album, titled Gundam Rock, is a sequel of sorts to W.K. 's 2008 covers record, The Japan Covers. The new album is entirely made up of English language versions of classic Gundam songs, and is being released to coincide with the 30th anniversary of the series. According to the press release, "The release will feature the music from the first 'Mobile Suit Gundam' television series and movie trilogy as Andrew's versions of the Gundam score and background music, plus Andrew will reenact Gundam's opening narration and the famous memorial speech that the Gihren Zabi character gives for his fallen brother." If you know what any of that means, you're probably even more stoked. Gundam Rock will only be released in Japan on September 9, but if you're willing to pay the shipping costs you can purchase it here.